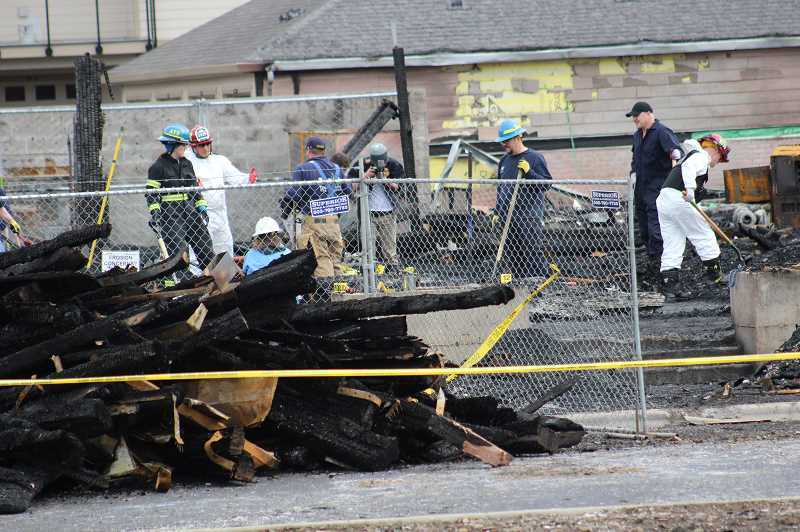 Investigators, officials and Wilsonville residents continue to grapple with a fire that devastated the Villebois neighborhood Sunday, March 31. To glean more information, community members came out in droves to two meetings at Wilsonville City Hall Monday, April 1 and Lowrie Primary School Tuesday, April 2. There, officials went over the particulars of the fire and provided an update on the investigation. The fire, which was reported at 1 a.m. Sunday, March 31 at a 34-unit, four-story condominium building under construction, damaged or destroyed at least 20 occupied condominiums, displaced about 25 people and destroyed 14 vehicles. No one was injured. Building Official Dan Carlson said six structures were destroyed while 16 structures were damaged. Five of the six structures were developed by Polygon Homes and one was developed by David Weekley Homes. "I think the whole community shares a concern about the impacts of the fire we had. The fact that nobody died and nobody was severely hurt is just huge. We've had in Wilsonville history fires that were much less significant in size but where people and children died," Wilsonville Mayor Tim Knapp said during the Wilsonville City Council work session Monday, April 3. "I'm very pleased we didn't lose anybody in spite of the impact and displacement of people." Rep. Courtney Neron, D-Wilsonville, who lives in Villebois, praised Tualatin Valley Fire and Rescue's efforts to put out the fire and community members for knocking on doors, setting off car alarms and spraying roofs to save their fellow neighbors and mitigate damage in the wake of the fire. "There are a lot of heroes in this story," she said at the work session. TVF&R incoming Fire Chief Deric Weiss said at the work session that in his career with TVF&R, which has spanned over 25 years, the department has responded to three similarly large and damaging fires and that all cases were analogous to the Villebois fire. The complex that burst into flames was under construction and did not have fire protective infrastructure such as firewalls and sprinklers implemented yet. "There was a structure at it most vulnerable point: under construction, wood exposed, four stories tall, large, (34) units, that caught fire. Because the building of that size, that type, that was a rapidly moving fire that got large very fast. There was a lot of radiant heat that came out of that fire," Weiss said. "Had we been in my estimation three weeks out we would have had firewalls, siding, it would have been a much different situation," Carlson said at the work session. Neron said in an interview after the meeting that she would look into potential legislations to make construction sites safer and Councilor Ben West told the Spokesman that mandating nightly security checks at construction sites could be an option. However, Carlson said construction oversight is largely determined by the developer, though the City can impose some regulations. "I think it's reasonable that when they're at their most vulnerable that there is some sort of watch on those buildings," West said. Knapp said in an interview that imposing such mandates could deter development. "We've had millions and millions of dollars in private sector construction in the last 10 years. Virtually all of it has gone without a hitch," Knapp said. "Certainly this is a significant event. I don't want to diminish the size of this event and the impact on people socially, emotionally and economically but you have to look also at the broader experience questions and look at what other communities do to have that discussion and see if there's anything we can learn." Carlson also said the City would look into whether the fire sprinklers located in the occupied condominiums went off and determine their effectiveness. As for the investigation, which has involved the Oregon State Police, Clackamas County Sheriff's Office and the Bureau of Alcohol, Tobacco, Firearms and Explosives (ATF), fire Marshall Steve Forster said at the meeting that they treated the construction site as if it were a crime scene — cordoning off the area from the public, collecting evidence, processing warrants — even though they had no evidence pointing to a crime at the time. The agencies completed the on-site investigation last week and will continue to examine evidence and collect more evidence from that night moving forward. To provide a tip, call 503-723-4949. "I know several pieces of evidence were sent to the crime lab for analysis and that takes a little bit of time to process," Wilsonville Police Chief Rob Wurpes told the Spokesman. "In my 17 years with TVF&R this is the most well resourced investigation I have ever been a part of," Forster said. "We're moving as fast as we can but also carefully as well." Then on Tuesday, April 9, the Clackamas County Sherrif's Office said authorities were looking for a Jeep that drove near the scene at 12:49 a.m. the night of the fire. The Jeep was not considered a suspect vehicle, but the authorities hoped the driver could be a witness. At the meetings the previous week, there was also some talk about whether the incinerated Polygon Homes development would be built again and Carlson said the developer could do so provided that it applies for and is granted another building permit. Polygon would not have to go through Development Review Board project approval as long as the project remains essentially the same. "From a city perspective, it was an approved project. It made its way through the planning phases, permitting phases," Carlson said. "Once the dust settles they could re-apply for permits and we would move forward with issuing those permits and approving them." The morning after the fire, West started a GoFundMe account for those who sustained losses during the event. As of last week, the fund had over $13,000 in donations. However, because he started the GoFundMe, the money raised is taxed as if it were monies accrued by West. So West is starting a nonprofit (which is tax exempt) for the relief effort that would help with Villebois fire relief efforts as well as future disasters in the Wilsonville community and the money from the GoFundMe will go into the nonprofit. "We're doing it in an ethical and transparent way," West said. "From my bank account is probably not the best way to do that." TVF&R Public Affairs Officer Stefan Myers told the Spokesman that the fire department had received requests from community members for fire safety training sessions in the coming weeks and Myers said last week that the department was planning to hold them, but hadn't yet ironed out the details. "Obviously this brought awareness of fire safety and leaving your home in short notice," Myers said.